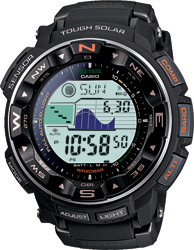 Introducing new PRO TREK high-performance outdoor watch for various environments including mountain and ocean. 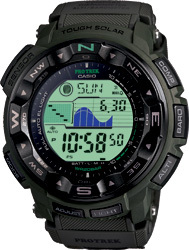 This watch not only offers the compass bearing and altitude features necessary for mountain climbing, but also strong water-resistance for river climbing and river rafting where the user may encounter strong water pressure, as well as convenient tide information for sea kayaking and fishing. 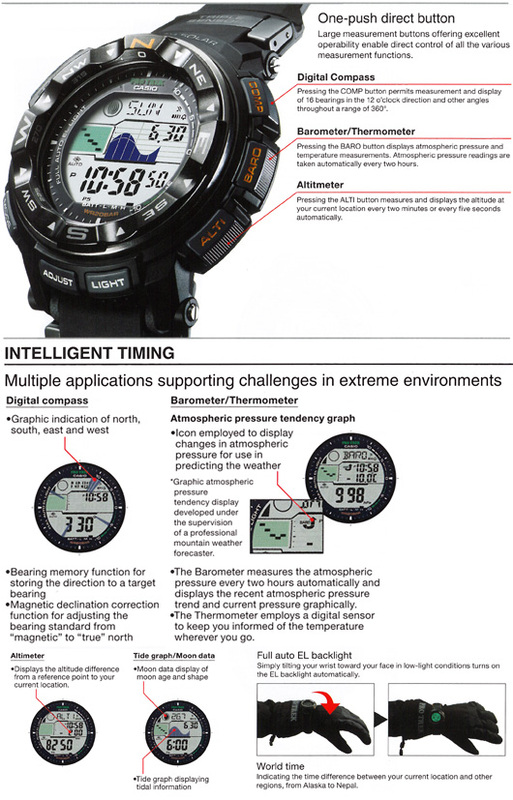 With a large display delivering outstanding readability, the PRG-250 has a dual-layer LCD construction. 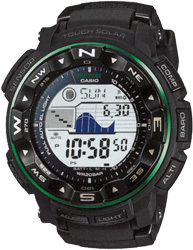 The sensor and other data are shown on the upper and lower LCDs, allowing the user to easily see the desired information. 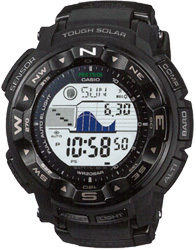 In addition to being displayed numerical and in a trend graph, atmospheric pressure is shown using simply designed arrow icons which depict characteristic barometric pressure patterns. This function was developed under the supervision of a meteorologist. Consequently, an upward arrow is displayed when the atmospheric pressure suddenly rises, forecasting better weather ahead. A downward arrow appears when the pressure suddenly falls, indicating weather deterioration. 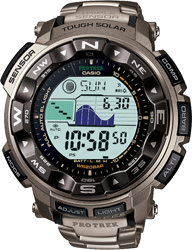 There are also arrow icons to show when rising pressure changes to falling pressure, or vice versa, making it easy to ascertain weather changes.